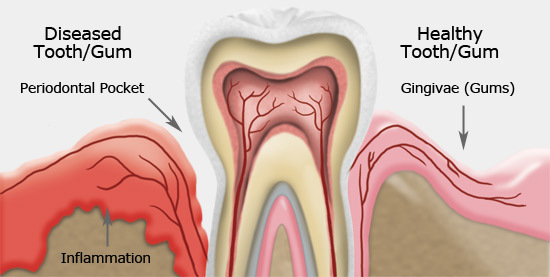 Have You Been Diagnosed With Periodontal (Gum) Disease? Do your gums bleed or have a bad odour at times? These can be signs amongst others of a slowly progressing bacterial infection of the gums called Periodontitis or Gum disease. Tartar (hardened plaque) becomes stuck between the teeth and causes the gums to become inflamed…they can be tender, red, puffy and bleed easily. Over time, this process destroys the jaw bone which holds the teeth in place, causing the bone to degrade and ultimately leads to loosening of the teeth. At Finch And Keele Dental Office treatment for periodontal disease is tailored to each individual patient. It focuses on removing the tartar and bacteria from beneath the gums to provide a healthy supporting structure for the teeth. A combination of scaling and root planing coupled with the occasional use of antibiotics is often recommended to remove this infection from below the gums to attain a bacteria free cuff of gum around the teeth. As with any bacterial infection, early diagnosis leads to improved treatment outcomes. The presence of untreated gum disease is dangerous to your health as it can have adverse effects on other diseases such as diabetes and heart disease. At our Downsview dental office in North York, we can educate you about the disease process and recommend specific homecare instructions so once we have treated your periodontal disease you will be able to better maintain a healthy dentition. Treatment for periodontitis requires a combined effort from you, the patient and our dental team. Copyright © 2017 by Keele and Finch Dental Office All rights reserved.